RAND(Squawk): Help for hoarding tendency or when keeping too much stuff. Help for hoarding tendency or when keeping too much stuff. Very few people live without possessions, many people live with too many possessions. Between those extremes is a spectrum of ownership. Commenting on someones levels of material possessions is rarely received with grace. Even an admiring "You have lots of stuff." comes across as "You have loads of junk." It's all about the point of view, one persons sacred collection of seashells and driftwood is another persons heap of bio-waste and major fire hazard. Possession hoarding is the difficult far end of the collecting items spectrum. Hoarding can have serious health implications and is certainly a state of mind problem. See this linked article for a full description of the symptoms and underlying thought patterns associated with hoarding. 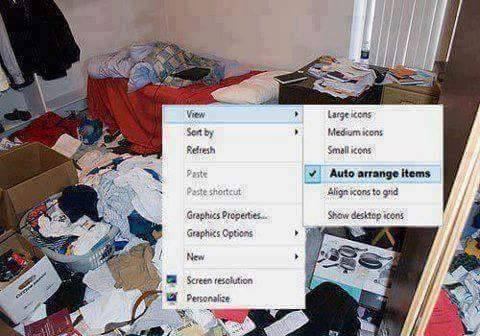 Like many frames of mind compulsive hoarders cannot see themselves as such. If hoarders do recognise there is a problem, they often feel so overwhelmed as to be paralysed by the thought of separating the good stuff from the junk. We are not going far into that spectrum, just providing some advice and methods for "thinning the heard", "lightening the load", "opening the shelves", "out with the old before in with the new". If the struggle is with a loft full of boxes or a "garage full with things that matter to me" then this article may be able to help. If you have a friend or relative living in the squaller of broken possessions, trash, and junk and you really want to help then, read the linked article above, understand the hoarding mindset and seek professional help. Anything else is just scratching at the edges of a serious problem. Check out online resources such as Help for Hoarders. A big pile of stuff arrives one item at a time and remains a problem every single day in which no clearing action is taken. Messy houses do not happen in a day and won't be cleared in a single day - take a forward step each and every day. B to A ) No, all my junk is stuff, all your stuff is junk. How to tell the difference between a "collection" and a "heap of stuff" ? My vinyl records are not a collection because most of them have no value ( too common ) and could not be sold together because they spread across too many musical genres. This makes them just a heap of old records. The real issue here is which items have emotional attachment and which have actual provable monetary value. If they are not all together and catalogued, they probably not a collection. Only others can say if the things in front of you have value. That value is only determined by an actual sale. You might like, love, value, cherish each and every item but that does not give them value because others do not see or have the perceived emotional links. Emotional attachment has a scale; do not fool yourself into thinking that every item has or should deserve the same level of emotional attachment. Grandma's ashes in a jar are not the same as the teaspoons she used or the newspaper she wrapped her shoes in. If you cannot distinguish between various levels of emotional attachment to different items then hoarding madness lies just ahead. Practice the separation skills listed below to test this aspect. Getting in the right frame of mind. For 3 minutes, close your eyes, relax and picture yourself looking out across an empty dessert landscape. Say 5 times out loud: "I see nothing and that is a good thing." Prepare for change with this simple thought pattern. Picture yourself holding an apple, in one hand and small knife in the other hand. The apple is rosy red, fresh and juicy but looking more closely the other side is bruised. Picture yourself cutting out the bruised flesh and throwing it in trash bin before eating and enjoying the rest of the fruit. Then see yourself putting core of apple in the same bin as the discarded flesh. Last of all image the garbage man taking away the trash bin to a far away place. Repeat exercise with an apple, pear, pumpkin and orange. Practice this visualisation to help with separation between good and bad then visualise fair use and disposal. Every morning and evening, first and last thing you do for a week prior and during clearing out project. Stand in a private space, naked with absolutely nothing on, not even watch or jewellery. Once relaxed and calm say 5 times out loud: "I stand here with nothing and I need nothing to stand here." Experience the bearable lightness of nothing. Do this exercise to free yourself from the bonds and weight of possessions. Visit your local dump/landfill, make a list of what facilities there are for recycling newspapers, cardboard, glass, metal, wood, plastic, electrical items etc. and think "Every thing has a place and a place for everything. Sometimes that place is the dump." Remind self that for end of life items the best place is the recycling depot or landfill and not being a fire hazard in the front room. "My grandmother had no emotional attachment to her hair rollers an neither do I". "My son had no love for his shoes and neither do I". "My neighbour has no on-going relationship with his newspapers and neither do I". For most things older is not better. Food rots, batteries die, newspapers crumple and fall to dust in the sunshine. Wood gets bugs and crumbles. Technology moves on, candle stick phones don't send texts. There is a natural order for the life of stuff. Keeping material possessions beyond their natural life time denies them the chance to be re-cycled and born again as new items for others to use and love. Recycling iron, aluminium and cardboard uses a fraction of the energy and land resources of digging up and processing new materials. Don't be selfish and block the natural order or resource incarnation. Recycling is not throwing stuff away but is actually saving the planet - do your part. Accept the circle of life. I will put 30 old newspapers / magazines into a box and take to recycle point or put out with trash. I will be generous and will find 4 items to take to the charity shop/good will today. These will be items that I would pay good money for and want to have. Take them to the shop. There will be less items in the house tonight than this morning. Before lunchtime I will separate the items in this cupboard into in-date or out of date and just the dump the possibly poison food. If you cannot get started on stuff re-organisational tasks because of overwhelming feeling of anxiety, indecision or hopelessness or just can't seem to put the same things together - then job #1 is to reach out to someone anyone, friend, neighbours, relative, church person or doctor for urgent help. Remember that "activity is no substitute for progress" moving things between piles or boxes does not reduce the size of the overall issue. Only letting go via a garage sale, charity shop, eBay or recycling depot is progress. Listed here are some of the basic skill needed to make progress with pile of items to separate the stuff from the junk. Practice them in just a small way before tackling the major task. Starting - Being ready to let go and move forward. The first step must be taken by deciding to move forward. Then get some boxes, tape and and marker pens. The clear storage boxes of moderate size that interlock and stack are a good start. A few similar sized moving boxes will also do. Matching - Put all the same stuff together in one place. Ordering - Stretching out a collection of the same stuff into an line based of value based on age, usefulness, colour, state of repair etc. Filtering - Knowing what is good to keep and what must go, what has value and what has not. Completing - Moving things out the door to the recycle point, ebay or charity shop. These skills are needed for minor reorganisation tasks. If you have a mountain of stuff - just close your eyes, go nuclear and call a cleaning or clearance company. Job done and relax. Practical recipes for clearing out junk. Use separation skills to divide items into 4 boxes. Once boxes are set up and labeled move quickly through the target items. Don't overthink any items, Don't reconsider after first decision has been made. By the end of today I will separate all the shoes in this room into 4 clearly labeled boxes based on "Fit me but I have not used them for over 6 months" and "Has hole or broken strap" and "No longer fit my feet" and "Some one would love these shoes when they come back into fashion". Keep one box and give one box to goodwill and put other boxes out for the trash. Think of eBay and Gumtree as a virtual storage company or warehouse. You put stuff into the virtual storage by selling it. Then if you ever need it again just buy it back. The difference between the buy and sell price is the "Storage costs". As it turns out some items go up and some down in price over time. This works for all items that actually have a value. If an item has no value because it won't sell on eBay then look closely as to why it is being kept. Revise the emotional detachment mantra above. Keep the memories alive (without the clutter) for emotionally attached items such as photos, posters even tee shirts and ties by building a virtual museum. Save the images and thus the memories without having the pile of clutter in your space. This simple tactic involved just taking a photo of the items and making a web photo album viewable on a PC or tablet. Photos software on a Mac or something from http://windowsreport.com/photo-album-software-pc/ will achieve this task. Once all the items are captured as an image the actual items can be all packed away together or sold as a collection. Doing a car-boot or garage sale. Nothing finds the value of items quite a quickly as doing a car-boot or garage sale. Pick out all those items that feel like they can't be disposed of "because they have a value" and take them to a car-boot sale or two. Accept that if the stuff does not sell then it really does not have a value. Recycle unsold items to return the resources to the planet for re-use. Pack a load of clothing/shoes/plastic toys/magazines into closed boxes and write the date on the outside and put in a place for no more than 6 month. If nothing is needed from those bosses ship them out unopened for recycling/re-sale. Do not reopen or resort the box. Putting tasks off today what will be harder tomorrow is a classic avoiding tactic. Remember that making a start, building momentum and completing something brings satisfaction and builds the possibility of the better future. There is a spectrum between just having too much stuff and chaotic hoarding. Too much stuff can be self-tackled but hoarding needs help. Article on symptoms and underlying thought patterns associated with hoarding. Message boards and general site Help for Hoarders. FlyLady housekeeping and life advice especially for those with a collectors tenancy"